Upon the whitewashed crosses standing over the seemingly endless graves of "unknown" soldiers who died in the great world wars of this century, these words are engraved: "Here lies in glory and honor..." or "A comrade in arms..." or "Known but to God..."
Certainly no one can read those words and look upon the graves of those fallen men without being sobered. Yet, to those who understand the biblical doctrine of the resurrection of the dead, these same graves are a sure sign of the incredible power of the living God, who will one day make all these men stand upon their feet and live again! Briefly stated, the doctrine of the resurrection is the truth that the God who resurrected Jesus Christ will also raise to life again (resurrect) all the dead. For some that resurrection will be to eternal life; for others it will be to physical life with an opportunity for eternal life; for some few it will be a resurrection to the second death. The religionists of this world rarely address the doctrine of the resurrection. The few who do usually misunderstand either the time, purpose, nature or numbers of the resurrections. 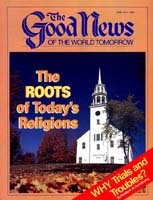 Some, in a feeble attempt to reconcile the non-biblical doctrine of the immortal soul with the resurrection, contrive a vague theory that the resurrection is not a resurrection at all, but merely a reuniting of the body of a deceased person with his immortal soul, which had been liberated at death and has been living without the body since. Certainly such a theory is in no way supported by the Bible, but it is a good place to begin a study of this important subject. The resurrection is one good proof that man does not have an immortal soul. If man had an immortal soul (which today's religionists would say lives after death), why would a resurrection from the dead be needed in the first place? Numerous utterly dogmatic Bible statements promise the dead the hope of life again after death! Notice the words of Paul in his defense before Felix: "But this I confess to you, that according to the Way which they call a sect, so I worship the God of my fathers, believing all things which are written in the Law and the Prophets. I have hope in God, which they themselves also accept, that there will be a resurrection of the dead, both of the just and the unjust" (Acts 24:14-15). To those who doubted that a resurrection for all would occur, Jesus Christ proclaimed: "Do not marvel at this; for the hour is coming in which all who are in the graves will hear His voice and come forth — those who have done good, to the resurrection of life, and those who have done evil, to the resurrection of condemnation" (John 5:28-29). Further, even Old Testament writers like righteous Job and Daniel knew and spoke of the resurrection from the dead (Job 14:14-15, Daniel 12:2). In addition to the wonderful promises of God Himself, we have an actual example we can look to as visible proof positive that God can and will resurrect the dead. That example is the resurrection of Jesus Christ our elder brother. The fact of the resurrection is clearly shown from the biblical eyewitness records and informed testimony (Romans 1:4, I Peter 1:3). But many have overlooked that while Christ's death pays for our sins, nonetheless "we shall be saved by His life" (Romans 5:10) — a life He is still living in us daily (since His resurrection, which brought Him back to life) through the power of His Holy Spirit (Galatians 2:20). Further, His resurrection is incredibly important to us for another reason. It proves by example that God can and will resurrect us. Since Christ was resurrected, we can be, too. He was not to be the only one resurrected, just the first! Notice: "But if there be no resurrection of the dead, then is Christ not risen: and if Christ be not risen, then is our preaching vain, and your faith is also vain.... But now is Christ risen from the dead, and become the firstfruits [not only one] of them that slept [died]. For as in Adam all die, even so in Christ shall all be made alive" (I Corinthians 15:13-14, 20, 22, Authorized Version). Yes, the promise of the resurrection is indeed the very hope of us all, since we all are only mortal and, unless resurrected, will die and remain dead without hope of eternal life. Nonetheless, the time and nature of this resurrection will not be the same for all. For, as Paul stressed: "For as in Adam all die, even so in Christ all shall be made alive. But each one in his own order" (verses 22-23). This passage of scripture goes on to say that Christ was first ("Christ the firstfruits"), and then "afterward those who are Christ's at His coming" (verse 23). Hence we see that, besides Christ, the first group to be resurrected from the dead are those who are the true called and chosen of God — those who "are Christ's" (that is, in whom the Holy Spirit dwells as a result of repentance and proper baptism — see Romans 8:9). I Thessalonians 4:16 speaks of the same time. Revelation 20:4-6 confirms the same event. Those who are resurrected then will be resurrected as spirit beings who cannot die (verse 6). They "shall be priests of God and of Christ, and shall reign with Him a thousand years [i.e., during the Millennium]." And this is not the only resurrection — verses 5 and 6 refer specifically to this resurrection as the "first resurrection." Further, verse 5 even tells us when the next — the second — general resurrection will occur in God's plan when it states, "The rest of the dead did not live again until the thousand years [the Millennium] were finished." This resurrection will be of all those who lived and died and, for one reason or another, have not had a chance for salvation. Obviously, this group comprises the bulk of humanity, for only relatively few have ever heard the name of Jesus, let alone truly received God's Holy Spirit. Therefore this resurrection is not of the spirit to eternal life (these, of course, have not yet qualified for God's Kingdom), but to physical life with, finally, a chance to learn of God's truth and qualify for His Kingdom. Note for proof verses 11 and 12 of Revelation 20, which find the rest of the dead (at a time after the Millennium) resurrected before God, not to be condemned, but to have the Word of God opened to their understanding so they can learn of God and qualify for His Kingdom. This is the second resurrection. The second resurrection is spoken of more fully in Ezekiel 37:1-14 where the physical nature of the resurrection is clearly seen, and where it is evident that the resurrected ones will finally know God. In an earlier issue we covered the subject of eternal judgment and explained at length about when each person will receive his or her calling and chance for salvation, and why. It is enough to say now that the three resurrections explained here form the dividing lines between the judgment eras God is using to deal with different people in different ways at different times. Finally, the Bible speaks of yet one more resurrection for the group not dealt with in either of the other two. This is the third resurrection. It is a resurrection to the second death, since those resurrected will be cast into the lake of fire and burned up. Daniel spoke of this resurrection in Daniel 12:2, where he said some would be resurrected to life and some to " shame." Christ also spoke of this resurrection in John 5:29 and called it the resurrection of "condemnation." Revelation 20:14 says this: "Then Death and Hades were cast into the lake of fire. This is the second death." It is actually a type of mercy killing, because those who die in the lake of fire, because of the twisted thinking that led them to become worthy of such a fate in the first place, would, if given eternal life, live out immortality in misery. Yes, in these three resurrections are contained the hope of all humanity. That hope is the promise of life after death in the resurrection from the dead. John 5:28-29, Acts 24:14-15 — both Jesus Christ and the apostle Paul predicted the resurrections. I Corinthians 15:12-24 — since Christ was resurrected, we will be also. I Thessalonians 4:16, Revelation 20:4-6 — the first resurrection is here explained. Revelation 20:5-6, 12, Ezekiel 37:1-14 — the second resurrection is described. Revelation 20:13-14, John 5:29 — the third resurrection is described. Yes, to some, those who died over the years, like the fallen soldiers mentioned at the start of this article, may indeed be "unknown" or, though perhaps known, unremembered. But God knows them all and will not forget them. For to them — and to all of us mortals who know we shall die but know not the hour — God offers the blessed hope we may all long for — the resurrection of the dead to life again with the hope of eternal glory!